Have you ever listened to the voices narrating commercials and documentaries on TV and thought, �I�d like to do that�? Or have your friends complimented you on your speaking voice? Then �Introduction to Voiceovers� is for you. There is something very basic about the voice-over world that you need to know right now. Simply having a "great voice" is not enough. I'm not denying the fact that it's necessary. It certainly helps...but your voice, by itself, is only one facet of your ability to succeed as a voice performer. This 6 week class will introduce you to both the craft and businesses of voiceovers. You�ll learn about the different areas of business utilizing voiceover talent (it�s more than just TV and radio commercials). You will work with real voiceover scripts from the different voiceover categories including commercials, narrations, industrials and promos so you can hear how you sound. You�ll learn all of this in a fun, beginner-friendly environment so you can see if getting into voiceovers is right for you. The class is taught by Marty Moran, who has made his living doing voiceovers since 1999. 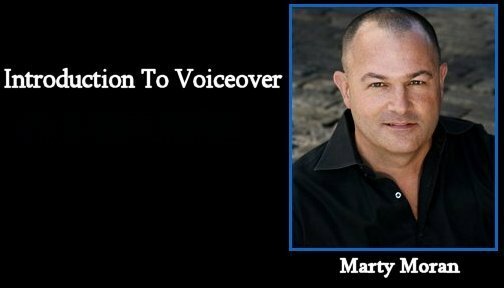 Marty�s voice has been used on projects for Land Rover, Chase, Nickelodeon, Sikorsky Aircraft, Hasbro, NBA, Starz, Pabst Brewing Company, Compaq, Mass Mutual, Dexatrim, US Army and many others.